Why Didn’t the Stock Market Sell Off on the Fed’s Taper Announcement? If you’ve read that the stock market staged a big rally yesterday on the news that the Federal Reserve’s Federal Open Market Committee voted to begin to taper its bond buying program by $10 billion a month beginning in January, you’re in possession of half the news. Investors saw no such thing. This is pure, unadulterated malarkey. That last sentence about confidence stands in stark contrast to what the Fed actually said in its announcement. The Fed noted that “the recovery in the housing sector slowed somewhat in recent months” and “Fiscal policy is restraining economic growth…” That’s hardly cause for rejoicing. The stock market did not initially rally at 2 p.m. on the Fed’s announcement – it did a bungee jump downward, as you can see on the daily chart here from BigCharts.com. That plunge is the patently normal reaction any sane market watcher would have expected after all previous hints from the Fed that it would begin tapering have sent the market into panic losses. But by 2:03 p.m., a very strange thing was happening. The market reversed course on a dime and the Dow Jones Industrial Average was up 51 points. By 2:05 p.m., it was up 125 points. By 2:10, up 158 points. By the close of trading at 4:00 p.m., it was up 292.71 points. The idea that the stock market took a Xanax after lunch and was in a confident, gleeful mood by mid afternoon is the stuff of tooth fairy yarns. Don’t think for one second that this was a genuine rally, that Wall Street is cheering its punch bowl being taken away, that removing $10 billion a month from speculators is chicken feed, that the onset of Fed tapering isn’t perceived on Wall Street as the horrific beginning of tightening of monetary policy. This was no rally. This was panic short-covering. Panic short-covering that fuels a rally of this size happens when big money has made bets on the market going down (shorted the market) and the market goes the other way, forcing speculators to quickly buy stocks to cover (close out) their open short trades to avoid steeper losses. That’s why there was such a huge spike in the market from the initial plunge at 2 p.m. versus the market being up 158 points just 10 minutes later. The obvious, and most important question, is who pushed the market up in the first place to panic the shorts? Who got the party started? That would have taken some serious money moving into Standard and Poor’s futures contracts or key component stocks in the Dow. Because of off-shore trading and dark pools, we’ll never know who turned the onset of Fed tightening into a rally and a cheery “vote of confidence in the economy.” But, it’s rather interesting to consider that outgoing Fed Chairman Ben Bernanke would not like his legacy to be memorialized as the guy who created a stock bubble, bloated the Fed’s balance sheet to $4 trillion, and then crashed the market on his way out the door. If this were a real rally, one would certainly have expected a rising tide of 292 points to lift all boats – or at least most boats. But some major social media and tech stocks, like Twitter, LinkedIn and Apple, closed down on the day. Below is the full FOMC statement on plans to taper bond purchases beginning in January, followed by the full statement of the FOMC below that. On December 18, 2013, the Federal Open Market Committee (FOMC) directed the Open Market Trading Desk (the Desk) at the Federal Reserve Bank of New York to purchase additional agency mortgage-backed securities (MBS) at a pace of about $35 billion per month and longer-term Treasury securities at a pace of about $40 billion per month, beginning in January 2014. The existing December schedules for agency MBS purchases at a pace of $40 billion per month and Treasury securities purchases at a pace of $45 billion per month remain in effect until that time. 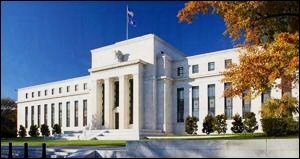 The FOMC also directed the Desk to maintain its existing policies of reinvesting principal payments from the Federal Reserve’s holdings of agency debt and agency MBS in agency MBS and of rolling over maturing Treasury securities at auction. The Committee’s sizable and still-increasing holdings of longer-term securities should maintain downward pressure on longer-term interest rates, support mortgage markets, and help to make broader financial conditions more accommodative. Information received since the Federal Open Market Committee met in October indicates that economic activity is expanding at a moderate pace. Labor market conditions have shown further improvement; the unemployment rate has declined but remains elevated. Household spending and business fixed investment advanced, while the recovery in the housing sector slowed somewhat in recent months. Fiscal policy is restraining economic growth, although the extent of restraint may be diminishing. Inflation has been running below the Committee’s longer-run objective, but longer-term inflation expectations have remained stable. Taking into account the extent of federal fiscal retrenchment since the inception of its current asset purchase program, the Committee sees the improvement in economic activity and labor market conditions over that period as consistent with growing underlying strength in the broader economy. In light of the cumulative progress toward maximum employment and the improvement in the outlook for labor market conditions, the Committee decided to modestly reduce the pace of its asset purchases. Beginning in January, the Committee will add to its holdings of agency mortgage-backed securities at a pace of $35 billion per month rather than $40 billion per month, and will add to its holdings of longer-term Treasury securities at a pace of $40 billion per month rather than $45 billion per month. The Committee is maintaining its existing policy of reinvesting principal payments from its holdings of agency debt and agency mortgage-backed securities in agency mortgage-backed securities and of rolling over maturing Treasury securities at auction. The Committee’s sizable and still-increasing holdings of longer-term securities should maintain downward pressure on longer-term interest rates, support mortgage markets, and help to make broader financial conditions more accommodative, which in turn should promote a stronger economic recovery and help to ensure that inflation, over time, is at the rate most consistent with the Committee’s dual mandate. The Committee will closely monitor incoming information on economic and financial developments in coming months and will continue its purchases of Treasury and agency mortgage-backed securities, and employ its other policy tools as appropriate, until the outlook for the labor market has improved substantially in a context of price stability. If incoming information broadly supports the Committee’s expectation of ongoing improvement in labor market conditions and inflation moving back toward its longer-run objective, the Committee will likely reduce the pace of asset purchases in further measured steps at future meetings. However, asset purchases are not on a preset course, and the Committee’s decisions about their pace will remain contingent on the Committee’s outlook for the labor market and inflation as well as its assessment of the likely efficacy and costs of such purchases. To support continued progress toward maximum employment and price stability, the Committee today reaffirmed its view that a highly accommodative stance of monetary policy will remain appropriate for a considerable time after the asset purchase program ends and the economic recovery strengthens. The Committee also reaffirmed its expectation that the current exceptionally low target range for the federal funds rate of 0 to 1/4 percent will be appropriate at least as long as the unemployment rate remains above 6-1/2 percent, inflation between one and two years ahead is projected to be no more than a half percentage point above the Committee’s 2 percent longer-run goal, and longer-term inflation expectations continue to be well anchored. In determining how long to maintain a highly accommodative stance of monetary policy, the Committee will also consider other information, including additional measures of labor market conditions, indicators of inflation pressures and inflation expectations, and readings on financial developments. The Committee now anticipates, based on its assessment of these factors, that it likely will be appropriate to maintain the current target range for the federal funds rate well past the time that the unemployment rate declines below 6-1/2 percent, especially if projected inflation continues to run below the Committee’s 2 percent longer-run goal. When the Committee decides to begin to remove policy accommodation, it will take a balanced approach consistent with its longer-run goals of maximum employment and inflation of 2 percent.